Meanwhile, in the streets of Chiangmai throngs of people love to stand in rows, waiting with buckets and hoses to douse everyone going by. Whether you're on a motorbike or a bicycle, in a car or a truck or just walking, you cannot escape the fun of Songkran. The Chiangmai people always seem to find a way to make sure you have as much fun as they do. 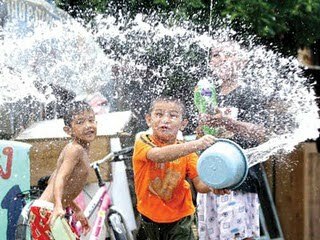 Water throwing is one of the most humorous and enjoyable parts of the Songkran festival. It can happen anywhere, and while you're here during Songkran you can enjoy it as much as everyone else. If you're coming into Chiangmai by train you might want to dress appropriately; that is, you might want to dress for fun. The passenger, sitting comfortably in a railway car, can receive an accidental splash through the window from the frolicking festivities outside. While all of this is going, on, lest we forget the moving water vehicles, be prepared for pickup trucks filled with splashers going by at every corner. This crowd tends to over do it and they don't quite seem to understand the concept of gravity ! That water can be very heavy coming down from above. All of this is loads of fun, and as the Thais say, "It's Sanook-Dee", but there are cautions involved and one should be aware that accidents do happen during the Songkran Festival. Be aware, be smart, and have fun.